Today, both adults and children are using iPads, tablets and phones to read. 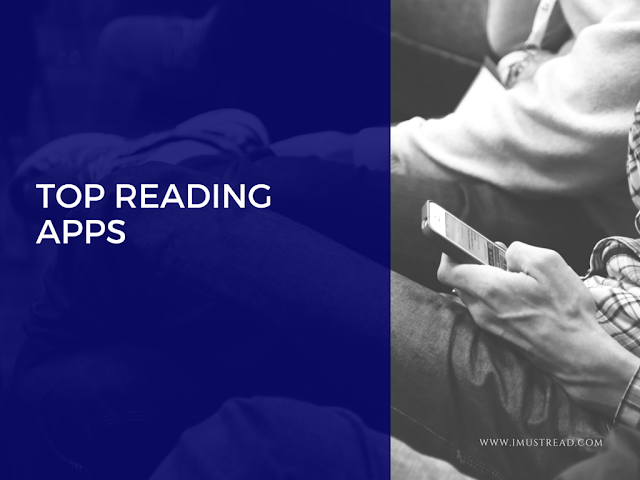 A major benefit to reading on a mobile device is the amount of applications that are available to download, many in which have the ability to better the reading experience. Plenty of schools and public libraries have made downloading books on a mobile device an alternative option to physical books. There are many adults who may always choose a physical book over reading on a mobile device, but there are others who enjoy the innovation, accessibility and the fact that downloaded books don’t take up space. Many of these apps have collections for teens and children as well. This app contains genres such as romance, thrillers, biographies, history, horror, politics, and more. The large variety stems from the library that holds over 100,000 options. Filtered with lists such as award winning books, favorites, best sellers, and upcoming film adaptations, it’s easy for readers to find their perfect reading fit. Blio’s eBooks can be read on any eReader or app, as well as nearly any mobile device. The reading experience is bettered due to its clear and colorful presentation and the option to adjust the text size. Thanks to the PDF format, cookbooks, travel guides and other genres that are heavy on images, are easily viewed. Built with the MOBI format, eBookMobi allows for heavier and more complex content, like a dictionary. It’s also a beneficial choice for reading comics. It’s available in a number of languages, and changing to your desired brightness is an easy task. This app will set you up with the reads that suit you the best. Just by entering your favorite titles and genres, Good Reads will match you with a new option based on your interests. It can also act as somewhat of a book club, allowing you to join your friends’ discussions about their favorite and least favorite books. You may know Google Play Books as Google eBooks. With recommendations, the ability to take notes, translate, and create wish lists, the reading experience is made even more personal. iReadItNow isn’t for actually reading eBooks, but it makes a good addition to whatever eBook app you decided on. You can track your reading activity, record what you like and dislike about specific books and plan ahead for future reads. If you’re the type to take notes while reading, this app is for you. Whether you’re looking for an old classic, something new or a whole series, Kobo’s selection can provide them all. Whatever you choose, use the synced bookmark to avoid losing your spot. The wide variety will not only satisfy adults, but teens and children as well. Speed and intelligence are most certainly two fitting words for this app, as well as two elements users appreciate and look for. With a reading timer, highlighting tools, the ability to group books by page number, and more, it’s no wonder Marvin is referred to as intelligent. Personalization is brought to the next level with Megareader. Along with the basic personalization options, this app also allows you to choose color schemes for your books. The safety feature is the most unique. It’s called Heads Up Display, and activates the rear facing camera as you’re reading on the go. Since pedestrians aren’t going to stop using their phone while walking, this app can at least increase the safeness of it by showing readers what’s in front of them. Earlier in this article, it’s mentioned that many libraries have made the change to offering eBooks as a circulation option, and OverDrive is how many of them do it. The easiest thing about it? All you need is a library card! Along with eBooks, OverDrive also offers audiobooks, TV shows and movies. This interactive reading app encourages users to share their thoughts while reading and learn what others were thinking during those same parts. There’s no need to worry if you’re online or offline, Wattpad’s stories are easily accessible. While reading a physical book has major benefits of its own, children’s reading apps are filled with resources that a physical book can’t provide. Apps offer a different kind of learning technique, with engaging activities presented throughout the reading, as well as helping children become familiar with today’s technology. Whether your child needs to improve on a certain reading skill, or you just want them to continue reading, these apps can supply the help you’re looking for. These apps are also ideal for learning on the go. Encourage them to choose these apps, although you probably won’t need much convincing, and watch their brain power grow! This app comes with nine word and letter activities to get your child on the right reading path. Learning consonants, short vowels and long vowels are the basic fundamentals of reading, which makes this a good beginners app. Since it was developed with educators, Duck Duck Moose Reading can be considered a trusted education source. Elmo loves ABCs, and so will your children after using this app. The games, activities and videos introduce children to different letters, sounds and words. With a lovable character like Elmo, children will be going back for more. These interactive games are beneficial for learning vowel sounds and syllables. Suitable for ages 6-8, the fast paced activities keep users on their toes. Reading Rockets’ literacy apps are available in a variety of topics, including comprehension, dyslexia and learning disabilities, multimedia composition, phonics, print awareness, spelling, vocabulary, and writing. This app contains hundreds of quality books, engaging games, a parent dashboard, and two different types of reading modes. With the option to have a book read to them by a professional actor, children get to fully absorb the story. When they’re ready to give it another shot, children can switch the mode to read by themselves. The reading raven takes children on a reading adventure. With multisensory reading games offered at different levels, children can have fun and learn at their own pace. Whether they’re just beginning to identify each letter or already comfortable with forming sentences, Reading Raven will continue to build their knowledge. In this app, the children are the magicians, finding the missing letters to create a word. Spelling and pronunciation is made fun, which is why this app is effective. Bookworms rejoice! Most of these apps are free or highly affordable. Whether you plan to download some great apps for yourself or ones to motivate your children to read, there are many options to consider. Pick the ones that best suit you and your needs! GoodCellas is a company that sells quality used phones and takes in old devices to provide its customers with the best trade in value. With years of experience in the industry, GoodCellas is always up-to-date with the latest mobile device trends and news.